David Michener is the Associate Curator of the University of Michigan Matthaei Botanical Gardens and Nichols Arboretum. He oversees the world-famous peony garden in Ann Arbor. All the cultivars in the garden are pre-1950, beginning in 1796 from Japan, Korea and China. International review has confirmed the significance of all the cultivars, over half of which are commercially extinct. DNA studies are conducted to determine ancestors. University of Michigan gardens also have a bonsai collection and a native plants garden which contains one quarter of all plants native to Michigan. The garden has perfect conditions for peonies: Clay soil that is well-drained, in other words, on a hillside. The sunnier the spot the happier the peonies! If they do not bloom sunshine is the first factor to consider. Peonies live for such a long time that nearby trees can grow without the gardener noticing that shade is creeping up on the garden bed. There are three kinds of peonies. Herbaceous are the common ones (there are 4000 varieties) that we have in our North American gardens that live a very long time. They have superior ornamental value and are used for cut flowers. Their negative trait is that they tend to flop over. We have all had the experience of admiring our beautiful peonies one day, and after an overnight rain they are a sopping mess lying on the ground. Tree peonies are much taller and generally have smaller flowers with a shorter blooming period which is not considered a disadvantage in Asian culture. 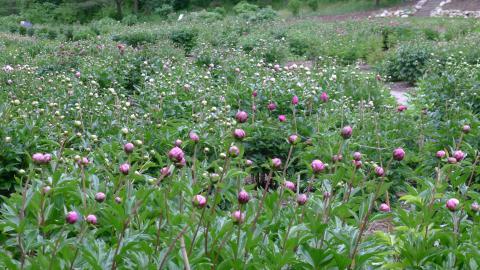 Intersectional peonies are hybrids of herbaceous and tree cultivars and often come in wild colors. Dr. Michener showed us pictures of many wonderful cultivars. He co-authored a book, Peony: The Best Varieties for Your Garden, and many of the photographs were from the book. I cannot do justice to the beauty and variety of the pictures. Many of our Master Gardener programs are visual treats, so I hope that members will come and share in the delights.